Santa's Little Pals Boxer Ornament measures 4 inches long and features a tiny Boxer nestled in a red stocking. The red felt stocking is embroidered with golden snowflakes and accented with clear beads. The delicate loop of ribbon is perfect for hanging from the family tree year after year. 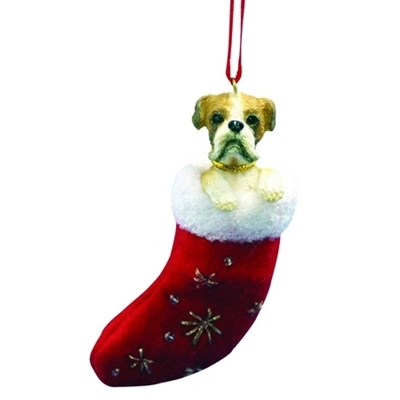 Comes in its own little gift box and makes a perfect gift for any Boxer breed owner.